What Should You Eat After Norovirus? Also referred to as the winter vomiting bug in Ireland and the UK, norovirus is a nasty virus that can occur any crowded place such as a classroom, cruise ship or camp, leaving diarrhea, stomach cramps and vomiting in its wake. This highly infectious virus belongs to a group of viruses called SRSVs (small round-structured viruses). Noroviruses have been found to be responsible for over 50% of all food-borne disease outbreaks. It is spread from one person to another through close contact. Symptoms usually start to develop within 48 hours after infection. Victims of norovirus usually recover after a few days. However, it is important to pay attention to your diet to fast track the recovery process. Here’s a list of what to eat after infected with norovirus. A norovirus infection causes dehydration due to the acute loss of water and electrolytes. Electrolytes are the minerals your body needs to maintain various body functions, including muscle action and blood chemistry. Symptoms of dehydration include passing very little urine, dry lips, mouth and tongue, sunken eyes, little or no tears when crying, lethargy and overall weakness. You should take plenty of water during the day to keep your body well hydrated. If you’re dealing with norovirus in a toddler, make sure to continue breastfeeding or formula-feeding them. Children should be given drinks sugars and salts added in the right mix to replace electrolytes and prevent dehydration. In case of severe dehydration, see your doctor. They might recommend rehydration solutions such as Ceralyte Pedialyte, Infalyte and Naturalyte. Avoid carbonated drinks, sports drinks, caffeine, fruit juice and tea. The BRAT (bananas, rice, applesauce and toast) diet can help with diarrhea since it consists of foods that are bland and easily digestible. They help make your stool firm and ease you back into eating normal foods after norovirus. 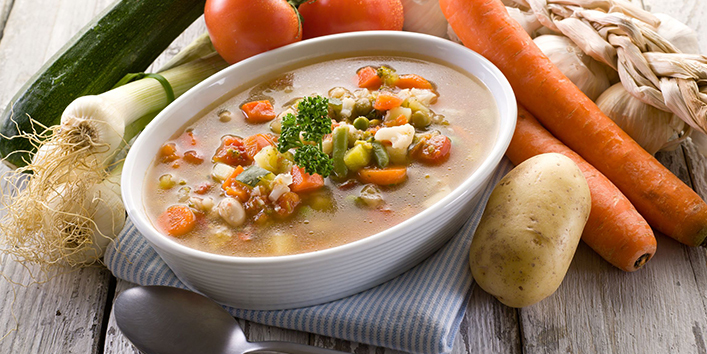 You can also include clear soups, boiled potatoes and crackers into your diet. Now that you know what to eat after norovirus, here are some natural remedies you can use to remove the remnants of the virus from the digestive system. Ginger Tea. Ginger helps fight pathogens and soothes the stomach after a bout of norovirus. Apple Cider Vinegar. Studies have shown that the antimicrobial properties of apple cider vinegar help to flush out toxins from the digestive system. Mix 2 tablespoons of apple cider vinegar with a cup of water and sip throughout the day. Activated Charcoal. You can take activated charcoal capsules to help remove toxins from the digestive tract and speed up healing time. Once the novovirus symptoms have subsided, add probiotics to your diet to replenish the needed healthy bacteria in your stomach. Foods that contain refined sugar can increase your insulin levels and lead to fluctuations in your blood sugar. While this might not have a direct impact on your stomach, it can make you feel shaky and clammy. This will definitely worsen your overall state. You should avoid cheese, milk and any other dairy products. You are unlikely to tolerate milk for several days after diarrhea. Soda contains sodium benzoate as a preservative. This can aggravate stomach upset. The carbonation and citric acid can also make things worse for you. Avoid all carbonated drinks until you’re feeling much better. Research shows that caffeine increases the need to move your bowels since it stimulates peristalsis. This is the process through which food moves through your digestive system. Caffeine also helps loosen stool, which is not a good thing if you are suffering from diarrhea. Cross off any foods containing caffeine in your list of what to eat after norovirus. If you have an upset tummy, you don’t want to eat fatty foods such as cream, soft cheese, nuts and most meats. Fatty foods are known to activate chemical receptors that slow down the emptying of your stomach. This will leave you feeling bloated and uncomfortable. Foods that contain too much acid such as tomatoes and citric fruits are a no go zone after norovirus. Acidic foods can cause acid reflux, which will only aggravate your discomfort. You should also be wary of fruit juices. If you eat spicy foods often, then you might be okay eating some after norovirus since you might have built up tolerance over the years. However, if don’t eat spicy foods often, then you might land into trouble. There’s a possibility of aggravating acidity in your stomach after taking alcohol. This is bad for you if you have a norovirus infection. Alcohol also contains chemicals that are difficult to break down, which can cause irritation in the stomach. It gets much worse if you have complications with your liver. Processed foods usually have a long shelf-life due to the amount of preservatives and other chemicals in them. These chemicals might aggravate your upset tummy. Resist the urge to consume processed foods no matter how inviting they might look. Your child or baby has passes 6 or more watery stools in 24 hours. Or if they vomit 3 or more times during the same period. Your baby exhibits mottled skin, fever and becomes less responsive. If there are symptoms of severe dehydration such as dizziness, passing too little or no urine, and reduced consciousness. Symptoms don’t improve after several days. If you have an underlying condition such as kidney disease.